My interest in cowboy shooting evolved out of my interest in shooting Cap and Ball revolvers. The bigger the better. I knew it was time to start a new project when a friend asked me if I would like a bag full of gun parts that turned out to be an Ami San Marcos second model Colt Dragoon. The old Dragoon was in bad shape. The loading arm was gone as was the loading ram, but the pivot where the ram and the arm connect was in the bag. There was a bracket welded to the right side of the barrel receiver where a previous owner had attempted to make an external loading lever. Figure 1 shows the residue of the loading bracket that was brazed to a recess that was ground into the frame. This will have to be removed before any progress can be made. I began removing the brazing by filing the brass down in an attempt to clean it off. This was moving so slow that I decided to speed the process with a die grinder. Welcome to the first Hobby Gunsmith newsletter! This idea came to me one morning while reading a book about using the Internet and I decided it would be a good way to contribute to my fellow cowboy shooters who like to work on our own guns. I posted the idea on the Frontier Spot at around six in the morning and headed into the shower. When I returned twenty minutes later I had already received about fifteen requests for the newsletter and it was time to start putting it into action. This is our newsletter and not mine. I have prepared all articles for this issue, but I invite everyone to feel free to contact me about any article ideas you might have or with articles you would like to contribute. I intend to feature the Dragoon project as it evolves from an old ASM bag gun and into a fine shooter. I also hope to do a series of smaller how-to projects to show how to do a variety of tasks on different guns used in cowboy shooting. I was very excited when Walt Kirst agreed to be featured in my first Hobby Gunsmith newsletter. I had agonized over how to do my first cartridge conversion on a Remington New Army revolver. How To -- Milling a Dovetail slot. Many people wrote to me about an earlier web article I wrote about using a drill press and grinder bits to mill a dovetail. I have been asked if a professional quality dovetail can be cut in a barrel using this setup and how to do this in the home shop. Professional grade dovetail slots can be cut in a barrel using a nine dollar 3/8 inch dovetail mill tool and a drill press. 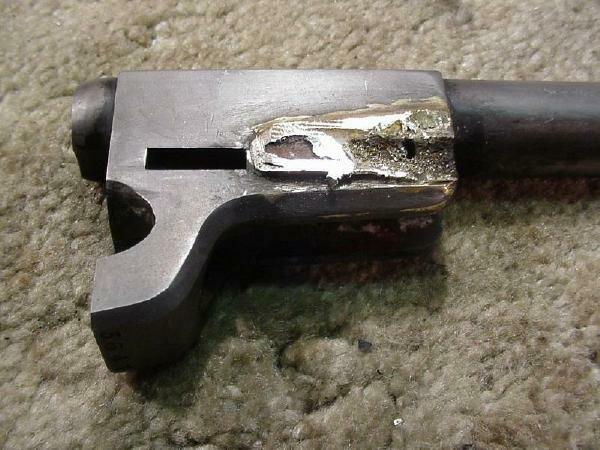 This article illustrates how to make these dovetail slots for putting an adjustable front sight on a 58 Remington revolver.